Buy now. Pay later. Sleep better. 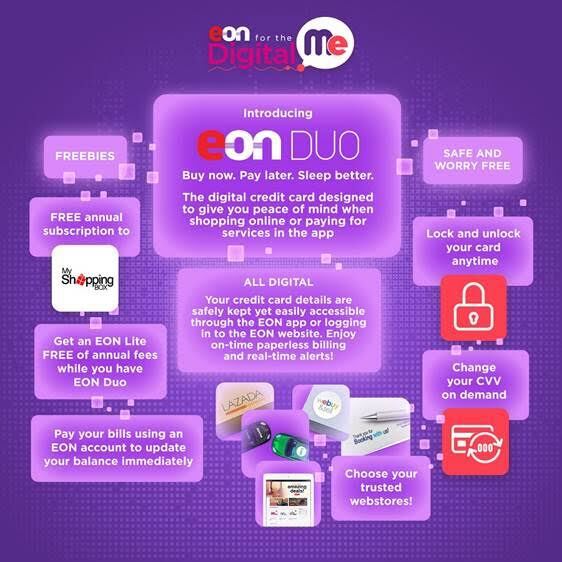 EON Duo is a digital credit card specially designed to give you peace of mind when shopping online, like in Amazon and eBay, or paying for services in apps like Uber and Spotify. It’s all digital! Your credit card details are safely kept yet easily accessible through the EON app or logging in to the EON website. You also enjoy on-time paperless billing and real-time alerts. It’s safe and worry free! Through the EON app or logging in to the EON website, you can lock your card at anytime and no charges will be allowed. You can also change your CVV, the three-digit number you would find at the back of a plastic credit card, but unlike a plastic credit card, you can change it whenever you please with EON Duo. What’s more, don’t let unwanted websites and apps charge your account for purchases you didn’t do. Spare yourself the hassle by coming up with your list of trusted webstores and only charges from them will be allowed to go through. When you get an EON Duo, you also get an EON Lite account free of annual fees. Pay your bill using your EON Lite account and your payment is posted immediately. Of course, you also get your free subscription to My Shopping Box. With your free subscription to My Shopping Box, you get your own US address where you can ship stuff you buy online. Once your stuff arrives, just log in towww.my-shoppingbox.com to have your stuff delivered to your doorstep at very affordable rates! EON Duo is just one of the many cool innovations of the new EON. To find out more, visitwww.eonbankph.com/experience/duo, Facebook /eonbankph, or Twitter @eonbankph.